SIR-C/X-SAR stands for Spaceborne Imaging Radar- C/X-band Synthetic Aperture Radar. The SIR-C/X-SAR is an imaging radar system flown aboard the space shuttle with two flights from 9 to 20 April 1994 and 30 September to 11 October 1994. Flying at an altitude of 215 km in a circular orbit and a 57 degree inclination, the three-frequency, multipolarization radar performs a variety of Earth environmental observations that improved our understanding of the Earth's carbon, water, and energy cycles. SIR-C/X-SAR consisted of a radar antenna structure and associated radar system hardware that was designed to fit inside the Space Shuttle's cargo bay. Radar images generated by SIR-C/X-SAR are used by scientists to help understand some of the processes which affect the earth's environment, such as deforestation in the Amazon, desertification south of the Sahara, and soil moisture retention in the Mid-West, covering two periods of the vegetation growing season. SIR-C/X-SAR was a joint project of the National Aeronautics and Space Administration (NASA), the German Space Agency (former Deutsche Agentur für Raumfahrtangelegenheiten DARA – now: Deutsches Zentrum für Luft- und Raumfahrt DLR) and the Italian Space Agency (ASI). It was an important step in a series of spaceborne imaging radars, beginning with SEASAT in 1978, continuing with SIR-A (1981), Germany's Microwave Remote Sensing Experiment (1983), and SIR-B (1984). It is a precursor to the Earth Observing System (EOS) imaging radar system. The SIR-C/X-SAR antenna structure actually consists of three individual antennas, one operating at L-Band (23.5cm wavelength), one at C-Band (5.8cm wavelength) and the third at X-Band (3cm wavelength). The L-band and C-band antennas are constructed from separate panels that can measure both horizontal and vertical polarizations. The SIR-C/X-SAR antenna was the most massive piece of hardware (at a total of 10,500 kilograms) ever assembled up to this time at the Jet Propulsion Laboratory, and measured 12 meters by 4 meters and consisted of three leaves each divided into four subpanels. The SIR-C instrument was built by JPL and the Ball Communication Systems Division for NASA and provides the L-band and C-band measurements at different polarizations. The L-band and C-band antennas employ phased array technology, which allowed the antenna beam pointing to be adjusted electronically. Each array was composed of a uniform grid of dual-polarized microstrip antenna radiators, with each polarization port fed by a separate corporate feed network. The SIR-C radar beam was formed from hundreds of small low power solid state transmitters embedded in the surface of the radar antenna. By properly phasing the energy from these transmitters, the beam was electronically steered in the range direction ±23 degrees from the nominal 40 degrees off nadir position without physically moving the large radar antenna. SIR-C was a dual polarisation radar and transmitted alternatingly vertically- and horizontally-polarized electro-magnetic waves. The backscatter from these transmitted waves were received on two separate channels simultaneously, so that SIR-C provided images of the magnitude of the echoe signals for four polarization combinations: HH (Horizontally-transmitted, Horizontally-received), VV (Vertically-transmitted, Vertically-received), HV, and VH; and also data on the relative phase difference between the HH, VV, VH, and HV returns. This allowed derivation of the complete scattering matrix of a scene on a pixel by pixel basis. From this scattering matrix, every polarization configuration (linear, circular or elliptical) were generated during ground processing. The radar polarimetric data yielded more detailed information about the surface geometric structure, vegetation cover, and subsurface discontinuities than image brightness alone. The X-SAR instrument is built by the Dornier and Alenia Spazio companies for DARA and ASI and operates at a single frequency. The X-SAR antenna is a slotted waveguide type, which uses a mechanical tilt to change the beam pointing direction. 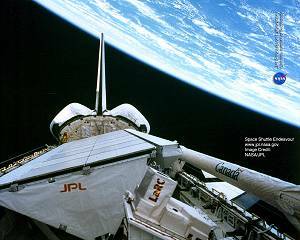 Source: NASA – What was SIR-C/XSAR (1994 Space Shuttle Missions) ?